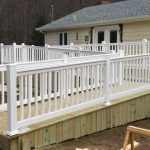 Railing – Precision Vinyl Systems, Inc. 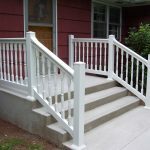 The addition of attractive Maintenance-Free Porch and/or Stair Railings improves your home’s “Street Appeal”, adds to your home’s resale value and provides an increased sense of home ownership pride. Most importantly, it allows you to and the ability to enjoy your home while you are living there. But don’t take our word for it, just browse our Installation Gallery to see for yourself. Don’t forget to check out Post Caps, Solar Caps and other accessories available on our Hardware & Accessories page. 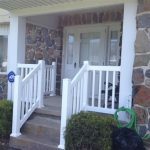 Vinyl Railing with Square Top / Square Pickets Custom made to the size you need at NO EXTRA COST TO YOU. 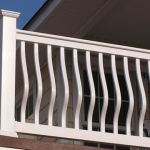 All railing includes aluminum in top and bottom rails. White or Almond or Khaki available. Pickets are 1.5" Square. 36" high is standard. White available in taller sizes. Thank you for looking at our products to receive a quote please call (570) 636-9878 or you may fax a drawing with your dimensions to (570) 636-3931 be sure to put your name, address, phone number and email address on fax. Thank you! 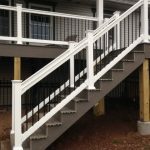 Precision Vinyl Systems, Inc.
T-Top Railing with Traditional Balusters. Made to your exact size & fully assembled with aluminum in top & bottom rails. 36" high. Available in White, Almond & Khaki colors. Almond & Khaki add 20% upgrade in cost. T-Top rail w/Decorator Classic Spindle. 36" high, made to your exact size w/aluminum in top & bottom rails. Available in White, Almond or Khaki vinyl with Black, Bronze or White aluminum spindles. Add 20% upcharge for Almond & Khaki. T-Top Rail with Belly Balusters. 36" high w/aluminum in top & bottom rails. Available in White, Almond & Khaki Add 20% upcharge for Almond & Khaki. 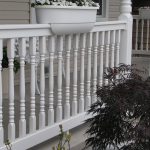 T-Top rail w/Colonial balusters - 36" high, Made to your exact size w/aluminum in top & bottom rails. Available in White, Almond & Khaki Add 20% upcharge for Almond or Khaki. T-Top w/Square Pickets, Made to your exact size. Standard 36" high, other heights available in white. Aluminum in top & bottom rails. Available in White, Almond & Khaki. Add 20% upgrade for Almond & Khaki.